SingleParentMeet.com is owned by the People Media group, a network that operates over 20 online dating platforms across multiple segments. The network has managed to bring together more than 10 million people from different parts of the world. The website came into existence in 2002 and since then it has grown in leaps and bounds over the years. All in all, it can be said that the People Media group is one of the biggest players in the online dating industry. The website manages to incorporate a bunch of useful features that would assist users connect with like – minded people. Given the fact that this website is one of the most affordable premium dating sites on the market, users have another reason to try it out. What makes this site stand out from others? While there is absolutely no doubt about the fact that SingleParentMeet.com is loaded with tones of features and goodies and has a humongous membership base, it doesn’t mean that this site is the best on the market. On the contrary, there are a few things that make this site different from the rest. The USP of this site certainly has to be its subscription charges. At $10 per month you get access to the complete set of options that this site has to offer. In addition, if you wish to make your profile stand out from others by getting it highlighted, it can be done at an additional cost of $1 per month. Another feature that you wouldn’t find in any other site is the ‘today’s birthdays’ option that shows you a list of people that are celebrating their birthdays. This could be a great way of initiating a conversation, especially when you’ve run out of pick up lines. While there is no doubt about the fact that this site sports a great design that is not only easy to use but also to understand and comprehend. However, it is worth noting that this website bears a strange resemblance with most other websites in the People Media network. Although this isn't a bad thing, you might feel bored in case you’ve already used a similar website in the past. Nevertheless, this doesn’t have any negative impact on the overall effectiveness of this website. ·Users can take advantage of a host of search options that make it feasible for them to find an ideal match. The search is loaded with several parameters that can be used for efficient filtering. ·Design your profile and add as many photos as you want. ·The ‘I’m interested’ feature allows users to keep track of those whom you might like to interact with. On the other hand, you'd also be able to keep a tab on who has added you to their list. ·Check out a list of new members that have joined the website. ·Read articles and success stories and learn about the tips and tricks of single parent dating. ·Single parents that have joined the website would also be able to access childcare support listings. 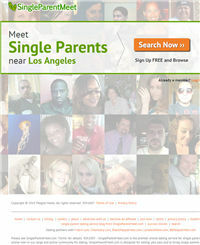 SingleParentMeet.com is very easy to register with. All you need to do is sign up using your email address and proceed onto the process of profile creation. Although basic membership of this site is absolutely charge – free, you'd have to pay a premium subscription fee if you wish to upgrade and access all the features available on the site. Monthly subscription starts from $9.99. As the website is owned by the People Media group, it goes without saying that SingleParentMeet.com is very easy to use. All the options are available at the discretion of users and they wouldn’t have to navigate in despair looking out for them. Nevertheless, in case there are any doubts pertaining to usage, the FAQ section and customer support wouldn’t mind helping you out. Besides, if you're looking to upgrade your membership, you'd be able to make payments using a credit card or via PayPal, thereby adding to the convenience. The website is certainly customer – centric and leaves no scope of any complaint. With top notch privacy control options, you would have complete control over every aspect of your profile and therefore, using this site is an absolute pleasure. Not only does the website filter out scammer with the help of highly efficient algorithms but also gives users the authority to report any other user that they feel isn't complying with the guidelines proposed by this site. The People Media network has always been known for its customer centric approach and SingleParentMeet.com is no different. Thanks to the availability of an extensive FAQ section and around the clock customer support cell, you'd face no issues with getting around the site and exploring the various features that is encompasses. SingleParentMeet.com is certainly not a perfect website. While the website is affordable and packs in a lot of features, we feel that the implementation is not spot-on and cannot match up to the standards set by SingleParentMatch.com. The search options aren't as efficient and most of the users on this site hail from the United States. All in all, if you're from the USA and know what exactly you're looking for, this site isn't a bad choice.